More space = more time to detect and react to hazards. You should try to maintain a space cushion around the front, sides and rear of your vehicle to give you enough time should you require it. Speed limits (mainly between 40km/h and 110km/h) are the maximum permitted speed even though good drivers adjust to slower speeds based on the conditions. Speeding is not OK and is a factor in 40% of fatal crashes. Speeding reduces the time to detect and react to hazards. At 70km/h in a 60km/h zone you require 30% more distance to come to a stop. Increased speed and wet weather increases the distance required to stop. 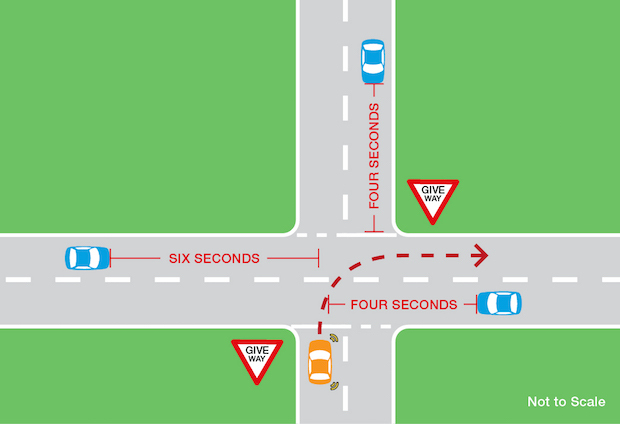 It takes 0.75 seconds to see a hazard and decide on a response and another 0.75 seconds to act (move foot from accelerator to brake). So 1.5 seconds are gone before you begin to brake – that’s 25 meters at 60km/h. The reduction occurs because your brain can’t keep up with the rapidly changing images in your peripheral vision. To compensate you need to scan left and right more often, moving both your eyes and head. Don’t take your attention away from the road ahead for too long as at 100km/h you travel 28 metres every second. To increase safety by reducing left and right hazards, 100km/h roads are wider, sometimes divided by median strips and have fewer cross intersections and less pedestrian and commercial activity. Similarly, 110km/h roads have no cross intersections, are divided and have multiple lanes. Even at 60km/h your field of vision is reduced by more than 50% so you should increase your scanning when in urban areas. If your speed doubles, crash severity increases 4 times. More than 2,000 pedestrians are injured or killed each year. A pedestrian hit at 60km/h has more than 70% probability of dying. At 80km/h they have almost no chance of survival. The more you exceed the speed the limit, the more your risk of a crash. In a 60km/h zone, every 5km/h over the speed limit doubles your risk of crashing. Warning signs won’t help if you’re going to fast to see or react to them. Controlling your speed is your responsibility. As speed increases, so should the gap between you and the vehicle you’re following as the stopping distance required increases. To ensure this use the ‘3-second gap’. Pick a stationary object the car in front passes (e.g. traffic sign) and count to three. You should pass the same object as you count three or after. If you don’t reach three, slow down until you do. These techniques automatically adjust for your speed (increasing the gap as you go faster). You should use the 4-second rule to increase the gap (and safety) in poor conditions including rain, fog, icy roads or night driving. Although these might seem like large gaps, remember that rear-end collisions are the most common crash types, so the gaps are necessary to avoid crashes. A space cushion allows a safe distance should you need to brake or change direction, potentially allowing you to avoid a collision. You should keep at least 1 metre between your vehicle and other moving or stationary vehicles (in case someone opens their door unexpectedly). This also protects vulnerable road users, reducing your chances of hitting them. Try to avoid having a vehicle on either side of you on multi-lane roads as your vision is impeded and your only option is to brake hard for a hazard in front of you. 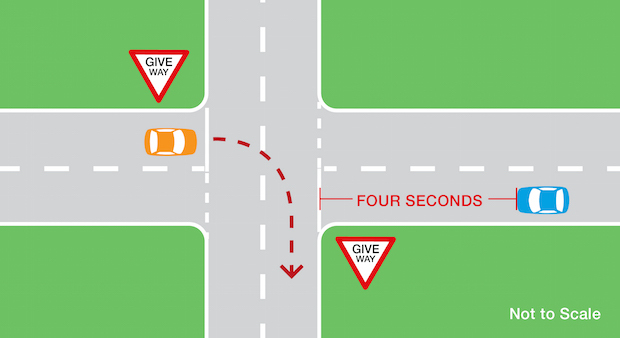 A better option is trying to keep space in the next lane/s so you can also move around a hazard. This might be difficult in heavy traffic, though this usually means you’ll be moving slowly and there’s less risk generally. Managing the space behind you is difficult as it mainly relies on the driver behind you. If they’re too close, slow down to give yourself extra space ahead of you. This will give you more time to slow down gradually for a hazard and will reduce the risk they will run into you. Around 1/3 of crashes involving drivers in their first year of a full licence are caused by choosing gaps that are too small and result in collision. This six-second gap needs to be a judgment, as you can’t count it out when you need to make the turn. Assuming a 60km/h zone and traffic is actually travelling at 60km/h you need a 4 second gap to oncoming vehicles. Each year there are more than 800 U turn related crashes reported to police. They are dangerous and should be avoided unless necessary. The better option is to turn into a side street and do a three-point turn so you can rejoin traffic in the right direction. Head-on collisions are often severe as the speed of the two vehicles combines (e.g. two 50km/h cars colliding = one 100km/h car hitting a stationary object). Opposing direction crashes make up about 16% of all crashes for full licence drivers. When overtaking you need enough space to avoid colliding with the vehicle you’re overtaking and oncoming traffic. Overtaking is usually done to maintain your speed - do not exceed the limit to overtake. Whenever possible, you should wait for overtaking lanes to overtake slow traffic. This will barely affect your travel time and eliminates the risk of a head-on collision. Scanning = taking in the 360° around your vehicle. To be effective, scanning should involve moving your eyes, head and/or upper body in a constant routine to detect hazards from all around when driving. To get your 360° view you need to look out the windscreen and side windows, look in the mirrors to see behind your vehicle and perform head checks to cover your blind spots on either side (head checks are vital when reversing, pulling out and changing lanes). Scanning should be constant. You should look up to 12 seconds ahead (60km/h = 200m, 100km/h = 500m). This will mean looking through the windows of other cars to see brake lights and indicators giving you more time to react. You should also scan side to side for hazards and constantly move your eyes and/or head. You should check your mirrors every 8-10 seconds for new hazards that may be rapidly approaching (e.g. emergency vehicles). Head checks to cover blind spots are vital when changing lanes. This routine will take about 10 seconds and should be repeated constantly. You can’t take everything in, so you need to filter what’s important when scanning. Your vision is designed to notice movement and change which is helpful, but you also need to be aware of stationary hazards (e.g. road works) so keep an eye out for both. Keep the radio/stereo at a reasonable volume so you are still able to listen for hazards like emergency vehicle sirens. Drivers continue to develop into their mid 30s, so you’ve probably got at least another decade to learn from experience and your increasing maturity. Theoretical learning doesn’t compare to experience in real traffic situations.